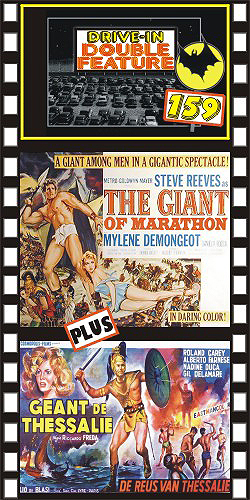 GIANT OF MARATHON (1960) Steve Reeves, Mylene Demonget, Ivo Garrani, Daniella Rocca. This classic epic was directed by Jacques Tourneur of Val Lewton fame. Reeves plays a courageous Greek hero whose muscle-bound heroics are a source of deadly frustration for the invading Persians. Final naval battle scene is most memorable. Plenty of excitement in what is considered one of Reeves best. Color, Scope, 16mm. PLUS: GIANTS OF THESSALY (1960) Roland Carey, Massimo Girotti, Ziva Rodann, Luciano Marin. A fine retelling of the Jason and the Golden Fleece tale. Watch for cool monsters, beautiful but evil women, and sword-wielding warriors in this top fantasy epic. Lots of cool action scenes in this very atmospheric film. Great color, Scope, 35mm. Subtitled in English.